These are the AAA and indie games that are worth your money. The Nintendo Switch is an excellent game console. If you don't want to quit collecting Power Moons in Super Mario Odyssey but need a change of scenery from your living room, that's entirely doable. Simply take the tablet out of its dock, slide your Joy-cons back on and you can pick up right where you left off, regardless of venue. But there's so much more to play on Switch. The problem is, aside from the games you can buy at retail, they can be hard to find, because Nintendo's digital storefront isn't very well organized. Which is what our list of the best Switch games is for. Simply search for these games by name in the eShop and you're guaranteed to have some fun. At the end of the day, games are games are games, regardless of whether you downloaded them onto your device or bought them at a brick-and-mortar store. While The Legend of Zelda: Breath of the Wild and Mario Kart 8 have name recognition, indie games are chock-full of ideas and themes that might be too risky or experimental for a studio with millions of dollars on the line. And for now, at least, indies outnumber everything else on Nintendo's latest console. The biggest difference is price. Splatoon 2 costs $60, while Stardew Valley will set you back only $15. Yes, Mario Kart 8 was great on the Wii U, and on the Switch it's even better. Why? Because no matter where you are, so long as you have your Switch, you're moments away from ruining someone's day with a well-timed blue shell. Sure, you might've just handed them the Joy-con a few minutes earlier, but we could all use a few more frenemies in our lives. 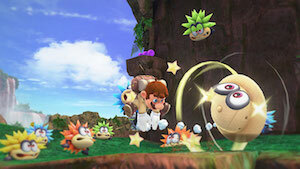 In addition to the portability, the Deluxe Switch version also packs in a smattering of new characters, karts and gameplay tweaks that weren't in the original. All that is to say, yes, even if you owned it prior, it's worth picking up again. 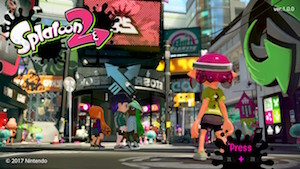 If you want an online multiplayer game on Switch, your best bet is Splatoon 2. It's a brighter, better version of the shooter Nintendo created for the Wii U. Basically, it's every squirt-gun war you had as a kid in video game form, except it stars mutant squid creatures (Inklings) that are at once terrifying and adorable. Unlike in other shooters, victory isn't predicated on how many opponents you've killed. Instead, it's all about how much of the arena you can cover in your team's ink. If you're used to playing a support role in games like Battlefield, you should be able to adapt pretty smoothly here, focusing on spreading your team's colors while others train their sights on the opposing team. Nintendo wasn't joking when it said that for Zelda to survive as a franchise it needed to change, radically. 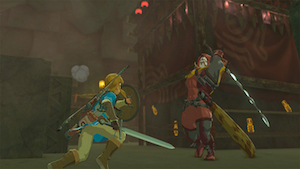 Legend of Zelda: Breath of the Wild is the first game to alter the tried-and-true formula established by the franchise's jump to 3D with Ocarina of Time in 1998. It borrows open-world and crafting elements from Western role-playing games like The Elder Scrolls V: Skyrim and blends them with something all too uncommon in modern games: respect for the player's intelligence. Wild expects you to learn by doing, not by its developers telling you how to do every last thing. The game world is absolutely gigantic, and around every corner there's another mystery to explore, be it a challenge shrine to conquer or a pink-maned horse to tame. Yes, it's also available on the Wii U, but that console is effectively dead, and besides, you can't play it on your commute. Super Mario Odyssey sells the Switch within the game's opening hour. Princess Peach has been kidnapped by Bowser once again and Mario has to travel across a multitude of diverse kingdoms to stop the unlawful union. He gets a new hat that allows him to possess enemies and use them to solve various platforming puzzles along the way. Moments later you're controlling a T. rex, smashing through obstacles to unlock your first of many Power Moons. Collect enough of those and you can move to the next kingdom and start the process over again. It's a simple concept to grasp; coupled with Nintendo's trademark charm and smart nods toward the series' past, it immediately justifies buying the console. That Nintendo released this and Breath of the Wild in the Switch's first year is impressive too -- usually the company puts a few years between its big franchises; both of these games deserve to be in your library. 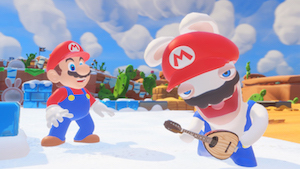 Getting strategy games right on a console can be tricky, but Ubisoft somehow married its adorable Rabbids franchise with Nintendo's Mushroom Kingdom to great success. The result is the very X-com-ish Mario + Rabbids Kingdom Battle. Developing a plan of attack always feels satisfying, as does seeing how each party member's (Mario, Luigi, Peach, etc.) disparate abilities work together. Seriously, watching an enemy get stuck in place on the battlefield because they crossed paths with Mario's sticky-honey ability never gets old. The puzzle sections that bookend each battle level aren't nearly as exciting as the main event, but the game is an otherwise perfect example of what can happen when two of gaming's most recognizable universes mash up. "Rhythm violence" is an odd descriptor to throw around, but it really couldn't describe Thumper any better. The trippy rhythm game has you coasting down a track as a scarab, banking off corners, jumping over spikes and "attacking" enemies by tapping the Switch's face buttons in time with the music. It's an awesome game when you're on the go, but make sure you pack headphones and that you aren't jostling around too much. One false move can send you back to the last checkpoint and reset your hard-won progress. Perhaps most impressive is that the game didn't lose much going from VR headsets to Switch's decidedly 2D version. As great as Rock Band is at parties, you aren't going to want to whip out a plastic guitar on an airplane to kill time on your flight. Super Beat Sports takes developer Harmonix's unrivaled beat-matching gameplay from its rock star simulator franchise, strips away the licensed music and replaces banging on plastic drums with clever and charming twists on stick-and-ball sports. 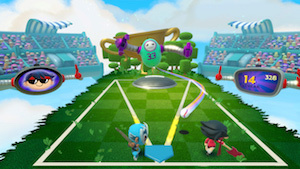 Each of the five mini-games features local multiplayer for at least two people, and up to four people can play "Rhythm Racket" and "BuddyBall." 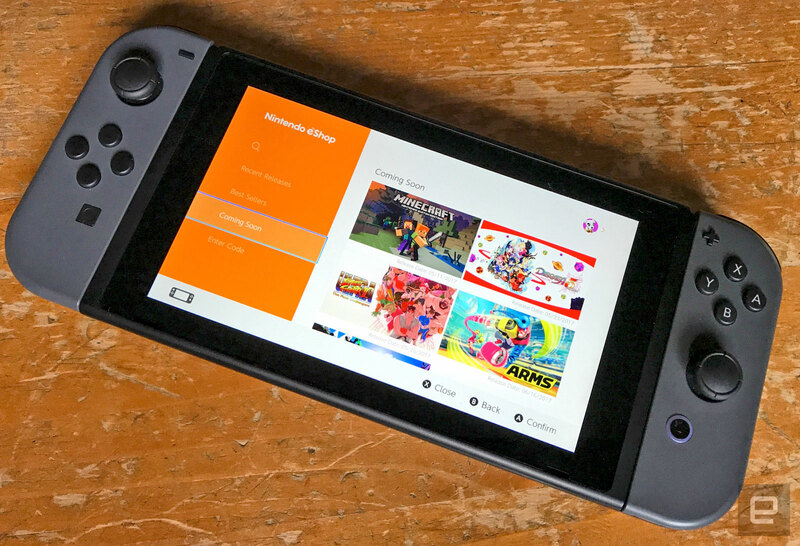 It's a game that plays to the Switch's core strengths as a fun, social platform, and proves addictive local multiplayer on the system doesn't always have to involve go-karts and Italian plumbers. Describing Nintendo's speed at releasing updates to its core franchises as "deliberate" is pretty generous. There hasn't been a new entry in the futuristic racing series F-Zero since 2004, and even then, that was a Gameboy Advance title exclusive to Japan. Maybe that's why the company has been keen to push Fast RMX, which is more or less F-Zero without Captain Falcon. 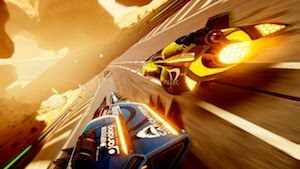 The series got its start on the Wii U with Fast Racing Neo, and Fast RMX follows Mario Kart 8 Deluxe in that it's an updated version of the original game with a boatload of additions. The first game's downloadable add-on tracks are in tow, and a recent, free update added six new ones. Of course, four-player split-screen multiplayer is available, and racing online with up to seven other adversaries is an option too. Of all the games on this list, Stardew Valley might be the most relaxing. 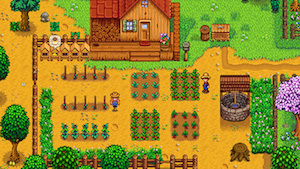 Developer Chucklefish's Zenlike farming simulator is a perfect chill-out game, offering the chance to plant crops, water them, take part in seasonal festivals, solve supernatural mysteries and even do a bit of spelunking if you're feeling particularly adventurous. There's something therapeutic about managing a virtual farm, getting your tract of land ready for spring after the long winter, picking vegetables, raising livestock and furthering relationships with fellow villagers. If Stardew sounds simple, that's because it is. But not everything needs to have complex mechanics or crushing difficulty to prove its worth. No, sometimes all you need to unwind after a long day at the office is for Grandpa to hand you the keys to the family farm so you can rebuild it in your own image.